In 2016 astronomical fall began on September 22, with the autumnal equinox, while meteorological fall began, as it does every year, on October 1. In the minds of many, though, the fall season pretty much gets underway the day after Labor Day. When I was a kid, shortly after the mastodons died out, my school years generally began either right before or right after Labor Day weekend, which is probably why to this day my mind turns to fall on that first Tuesday in September of every year, even though the astronomers and meteorologists see otherwise. As an avid motorcyclist, I see both good news and bad news in the arrival of fall. On one hand, here in the Midwest, the first part of fall offers nearly ideal riding conditions. Temperatures are cooler, but not yet cold, so that one may comfortably wear gear when riding. The countryside gradually becomes painted in fall colors. There’s a sense of abundance in the air as farmers are harvesting crops, wineries are making wine, etc. On the other hand, it won’t last. I have long likened motorcyclists to bees and wasps. Both become more active in the fall because they can sense that the end is near. Days become shorter. Wet or dry, fallen leaves on the pavement present their own hazards. Bees and wasps really are more prevalent, and they sometimes get sucked behind one’s windshield, into one’s shirt, or up one’s pants leg (don’t ask), where they may become agitated. Whether gradually or suddenly, even the daytime temperatures become less conducive to riding. And then there is the matter of snow and ice. But as the saying goes, we must make hay while the sun shines and get some riding in while the riding is still good. That’s pretty much what Ann and I have been doing since we got back from our Labor Day weekend run to Dubuque, which I still considered to be a summer trip. There is a direct, bittersweet relationship between the hours of daylight and the duration of our rides together as the fall season plays out. Those autumn rides can be so pleasant, so beautiful, I find myself wishing they didn’t have to end so soon. Inevitably the days and the rides become shorter, but we make the most of what we are given. We were blessed with some fantastic weather on September 18, so I ran up to Ann’s place early that morning and, after a bit of breakfast, we headed to Holy Hill, home of The Basilica of the National Shrine of Mary, Help of Christians. I love this place and I’ve written about it before, right here on the MGD Time blog site. Indeed the very first time I carried Ann on my motorcycle was in the fall of 2014, at Holy Hill. My 2014 article as it appeared in Thunder Roads magazine. She had agreed to meet me there and take some photos for me to use in an article I was writing for the now-defunct Wisconsin and Northern Illinois edition of Thunder Roads magazine. I was nervous as heck about carrying Ann. Lord only knows why. After walking the grounds at Holy Hill, I took her to lunch up the road at The Fox and Hounds—the round trip couldn’t have been more than ten or fifteen miles—and Ann, having been a motorcyclist herself, proved to be a most competent pillion passenger. She also took some stunning photos, which the magazine printed with my article. So nervous as I may have been at the onset, by the time I headed for home that afternoon, I was already thinking about how cool it might be to take Ann riding again. And the rest, as they say, is history. So it all started at Holy Hill, you see, and it seemed fitting that eventually we would return. There was no magazine article being written this time, no official reason to be there, other than to revisit this beautiful place and enjoy each others company. We had plenty of company this time, as apparently a lot of other people had the same destination in mind on this beautiful Sunday. Once we parked, we did something that I had never done at Holy Hill before, despite having been stopping there periodically for well over thirty years: We went to mass together. Doing mass at Holy Hill together proved to be a pretty cool experience, actually. I came away feeling like maybe I shouldn’t have waited so long. Then we walked the grounds for a while, taking in the majestic views and natural beauty all around us.The last time we visited, we had climbed the scenic tower in one of the twin spires, where both the view and the climb are quite breathtaking. But the tower was closed this time, so we opted to move on and enjoy a late lunch. 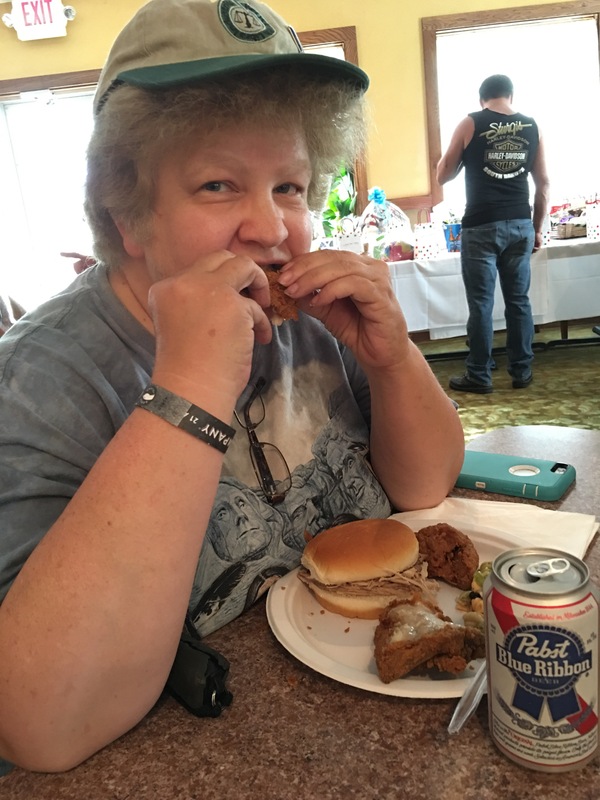 Ann had suggested the lunch stop in advance of our trip, a place called MJ Stevens, located outside of Hartford, along Interstate 41. What a delightful spot! This is a place that Ann’s mother enjoys and now I understand why. The atmosphere is pleasant, the food is very good, and the entire staff seems warm and friendly. Ann and I opted for sandwiches off the menu that day, but from all appearances, the Sunday brunch is also a worthwhile choice. I wouldn’t hesitate to go back or to recommend this establishment to friends. We rode around for a while after lunch, but the high point of this run had been our time at Holy Hill. I enjoyed going back there and attending mass at the basilica with Ann. She took most of the photos and all of the video clips you see here. I’ve said this before and I’ll say it again, if not for Ann, I wouldn’t have nearly as much cool stuff to show you from all these excursions. Our next run was on the weekend of October 9, down by me in Illinois, and it was a big one: the 30th Anniversary DuKane A.B.A.T.E. Toy and Food Run. Ann had come down last year for the 29th annual event and we had so much fun together, I invited her back. This year was a little different, though, in that Ann played an active role in helping me promote the event. This was my third year assisting the DuKane Chapter with PR and publicity for their flagship charity event, but this year—with no small amount of creative assistance from my dear friend—I was able to do a better job before, during, and after. Given the hours that would be involved that day, Ann drove down the night before and stayed over with my wife Karen and me. 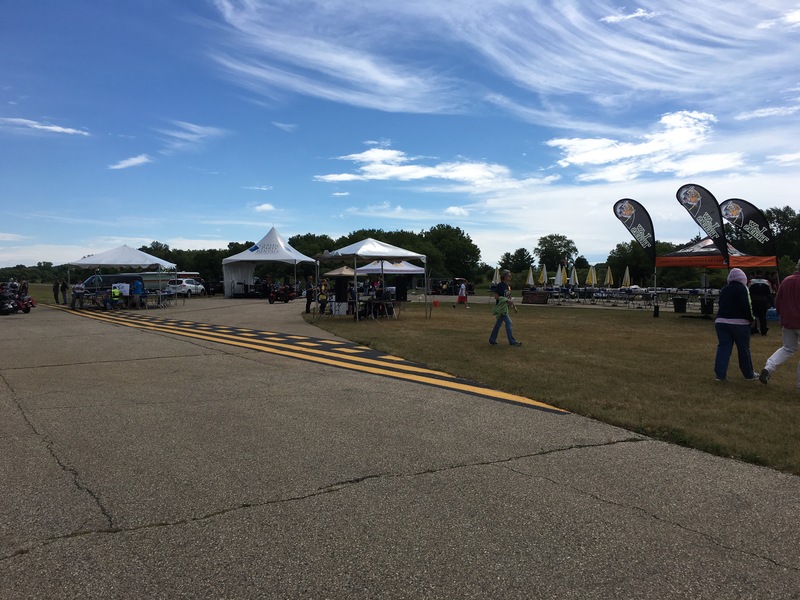 As Karen is not physically able to ride much, we arranged for her to meet us on the event grounds, where the motorcycle parade portion of the Toy and Food Run terminates and where a full day of music, food and fun begins. But I’m getting ahead of myself. After rising early and going to 7:30 mass at my church, we headed out to Fox River Harley Davidson in St. Charles, a remote registration point for the Toy and Food Run and a darned good one at that. After registering for the run and dropping off our toy and food donations, Ann and I (along with all the other attendees) were treated to a hot breakfast. 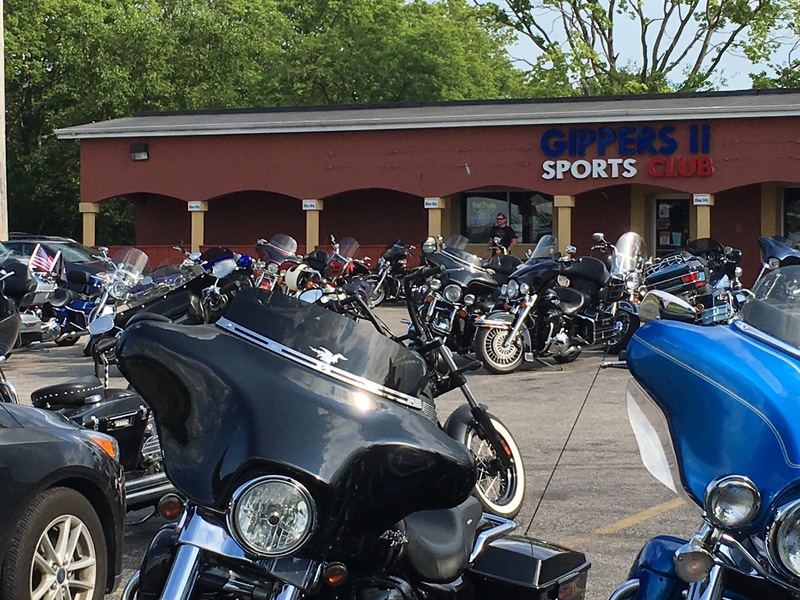 Then after perusing the dealership and checking out all the bikes parked outside, we assembled for a group ride to Elburn, which was the main staging area for the Toy and Food Run parade. There were motorcycles parked everywhere when our group arrived. We were directed to a parking lot about a block away from the pre-run festivities held outside of Knuckleheads Tavern on North Avenue. More and more bikes poured in as we walked the area, listening to live music, greeting people we know, looking at bikes, and otherwise being a part of the scene—just me, Ann, and a couple of thousand casual acquaintances. At the appointed time, everyone returned to their machines and prepared to roll out. When that many motorcycles fire up together, the word “thunder” is a very appropriate term that describes not only the sound, but the vibration that fills the very air around us. What a blast. 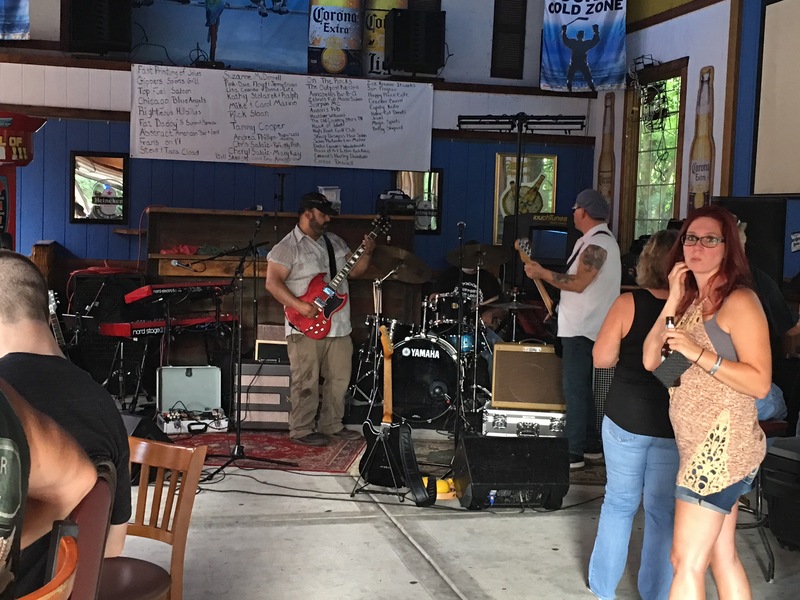 After we rolled onto the grounds of the Batavia VFW, located right on the banks of the Fox River, we were treated to hours of live music, provided by six different bands. As A.B.A.T.E. 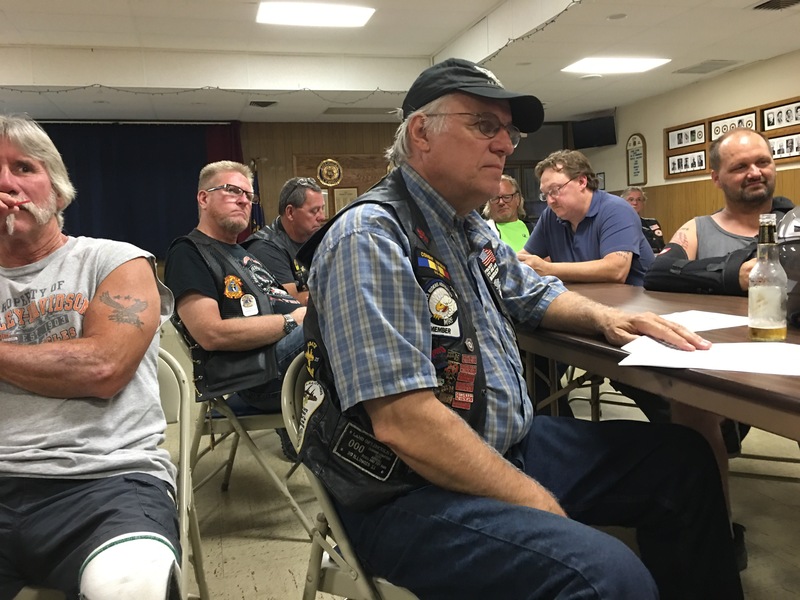 is a motorcycle rights organization (actually a sizable lobby), there were numerous politicians in attendance, including Illinois Governor Bruce Rauner, himself a motorcyclist and active member of A.B.A.T.E. There were many, many product vendors and food vendors, too. A very touching flag ceremony took place early on. We filled a couple of flatbed semi trailers with toy and food donations that were picked up the same day by numerous local charities. It felt so great to have been a part of this and we had such a good time again. Believe it or not, Ann and I are already talking about possible promos for next year. October 16 started out wet for me, but fortunately not cold. By the time I got to Ann’s place, the rain had moved on. We waited a while for the pavement to dry off, and then took a ride up into the Northern Unit of the Kettle Moraine State Forest. At one point during our ride, on a whim, I turned in at a sign I saw for the Ice Age Visitor Center, which turned out to be a nice little find. We took one of the trails and ended up at a scenic vista overlooking some of the prettiest fall color we saw that day. There was also a large observation deck out behind the visitor center itself, but as the sign warned, there were many bees, wasps and hornets nesting and flying about, so we didn’t linger there. When touring on a motorcycle, sometimes the best places are those we find by accident. This was one of those times. Our last run of the season, so far, was again rather local. I left home in the dark and ambient temps were still in the 40’s when I arrived at Ann’s. Remember, motorcycling inherently involves its own wind chill factor. I hadn’t opted to wear longies and was rather cold when I arrived. But it warmed up quickly after the sun rose and we did manage to get a nice ride in, albeit a short one. We revisited a place called Nature Hill, that Ann had taken me to see last spring, before the riding season had even gotten underway. We got a good walk in that day and I think I did a little better climbing that hill this time. I stayed long enough to partake in some crock pot beef stew that Ann had prepared before we headed out that morning. It was delicious! Still, the days have been getting shorter all season long and it was already dark when I headed for home early that evening. Although we have no more rides scheduled, I doubt very much that we are done for the year, not just yet. Conditions are such that we can no longer plan well in advance, but I assure you that on very short notice, if conditions and schedules permit, Ann and I will ride again. And of course you’ll read about it here. Ha! Thanks for hanging with me. 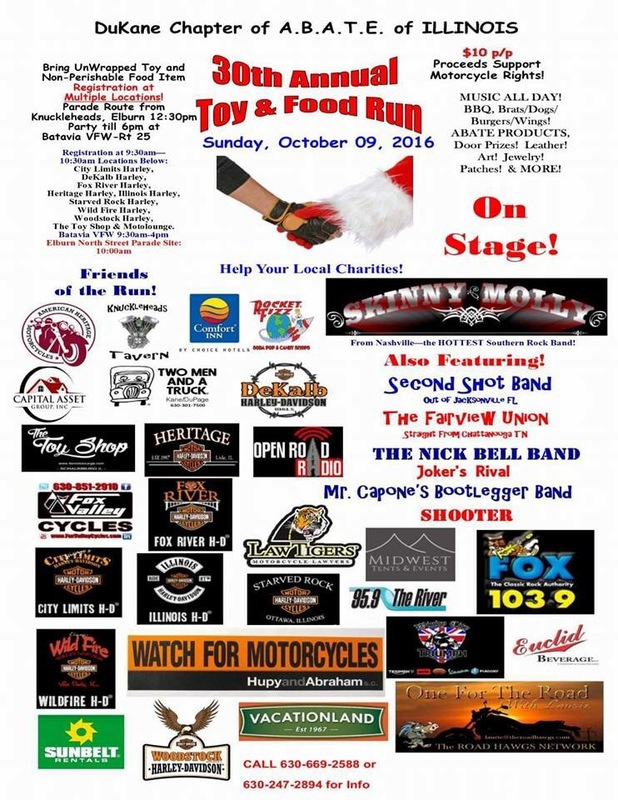 DuKane ABATE is hosting its milestone 30th Anniversary Toy and Food Run on Sunday, October 9th at Batavia VFW, on Route 25 in Batavia, IL. 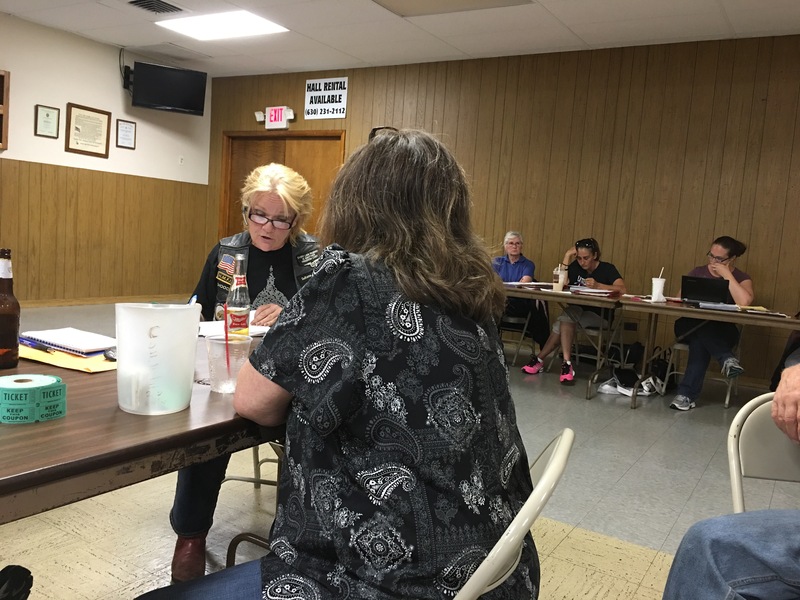 Motorcyclists from miles around, some from out-of-state, will once again gather at multiple registration and collection points before heading on to a central staging area in Elburn. A fully escorted parade, led by Santa Claus as well as many area lawmakers, including Illinois Governor Bruce Rauner, himself an avid motorcyclist, will make its way to the event grounds in Batavia. Toy and food donations collected for this charity event will benefit 18 local charities. The DuKane Chapter also maintains a Facebook page, https://www.facebook.com/groups/DuKaneABATE/, with several sub pages, where the most current information and event updates are provided. Once in Batavia, participants will be treated to a variety of live music from six different bands, merchandise vendors and more. Food and beverage vendors will be there, too, and this year’s food line-up alone is something to talk about. The following are scheduled to be on hand. Chico’s Tacos – People rave about Chico’s in Elburn. If you’re a fan, then you will be glad to know that they will be at the Toy and Food Run again this year. Enjoy! 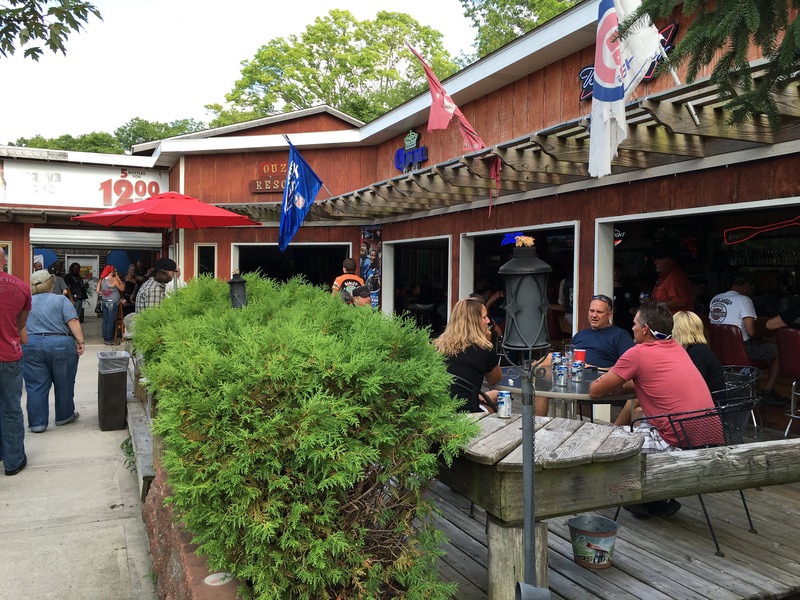 Coach’s Catch – Out of Worth, Illinois, Joe will be serving up deep fried shrimp, coconut shrimp, cod, corn dogs, and onion rings. Elburn Lion’s Club – A local favorite, the Elburn Lions will be offering hot dogs and sausages from Elburn’s own Ream’s Meat Market at this year’s Toy and Food Run. The bottom line is this: If you come away hungry from the 30th Anniversary DuKane A.B.A.T.E. Toy & Food Run, it’s your own fault! A.B.A.T.E. of Illinois is a motorcycle safety and rights organization that not only protects and fights for the rights of motorcyclists, but brings motorcycle safety and awareness to the community through speaking engagements, education at driver’s ed courses and visiting clubs and organizations. The DuKane Chapter represents the state organization in Northern DuPage and Kane Counties and maintains a Facebook page, www.facebook.com/groups/DuKaneABATE, with several sub pages, where the most current information and event updates are provided. What began on a whim as a novel way to promote the DuKane Chapter of A.B.A.T.E. of Illinois’ annual Toy & Food Run has snowballed into an entity unto itself. The DuKane Santa Girls are now a staple of the motorcycling community in northern Illinois and points beyond. How did this come to be? We put this question to Sara Elliott, the group’s Coordinator and a founding member of the Santa Girls. The 30th Annual DuKane ABATE Toy & Food Run will take place Sunday, October 9 at the Batavia VFW in Batavia, Illinois. The DuKane Chapter also maintains a Facebook page, www.facebook.com/groups/DuKaneABATE, with several sub pages, where the most current information and event updates are provided. Fans and followers of the DuKane Santa Girls can stay up to date on their appearances and promotions via their Facebook page (see https://www.facebook.com/DuKane-Santa-Girls-701322956613714/). I’m writing this having just come from a very well executed biker charity event, but what I want to talk to you about is not this event per se, but about that which drives events like this and makes them special—the generous nature of the motorcycling community at large. So while I show you pictures and talk a bit about what I observed today, I intend to go way beyond that. 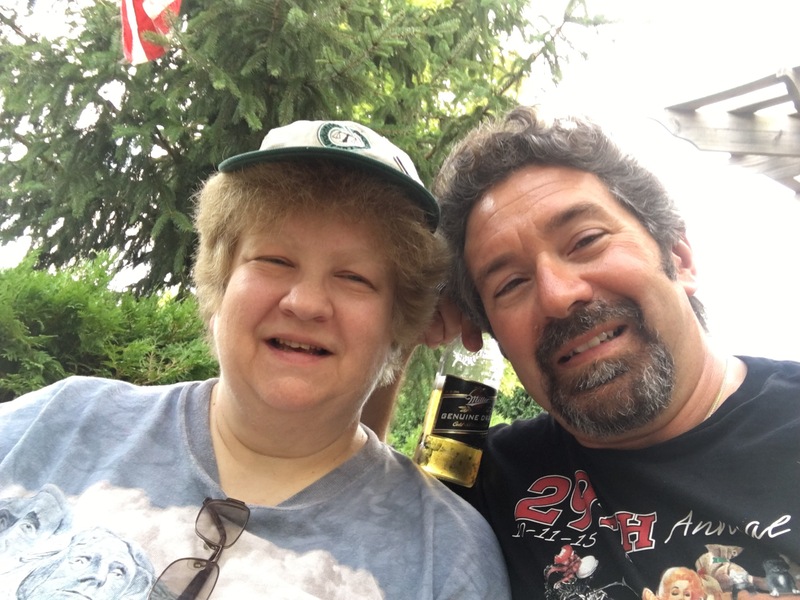 So yeah, my wife Karen and I wen to Gippers II in Coal City, Illinois, where a benefit was being held for a friend of the family, of whom we are both quite fond. Apparently lots of other people share that sentiment, becaus this event seemed to be quite well attended. But I have come to realize that’s not so unique in the biker community. On the whole, we are not rich people. We just have big hearts. For what it’s worth, Gipper’s II is a cool venue. I’d never been there before. 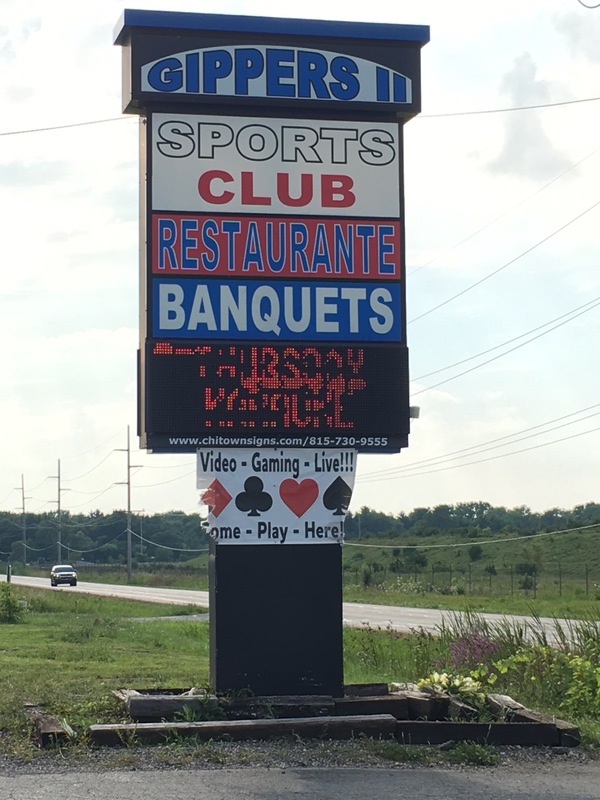 It’s big—certainly bigger than it looks from the parking lot.There’s a main bar, a courtyard area featuring a somewhat sheltered outdoor bar, and another facility, on the order of a banquet hall, beyond that. Friendly, helpful staff, nice atmosphere… I like it there. So Karen and I show up, and some people know us, but most don’t and that’s okay. We ate. We drank. We listended to the first band (alas, we weren’t there long enough to catch the second one. Those who know either or both of us would stop by and exchange hugs and talk a bit. Some who didn’t know us still engaged us in conversation and shared some laughs. That’s a biker thing. In any case, it was a great environment in which to find ourselves. But again, there’s more to the story. Just a few days ago, I learned of a biker chick from another group, out of state, with whom I am affiliated, who had gotten hurt in a bad crash with a truck. Probaby before she even got her cast on, word was being passed along within our group. A PayPal account was established and everybody stepped up and pitched in. The recipient was overwhelmed. Folks, I see this all the time within the biker community and it makes me proud to be a part of it. This is who we are! This is what we do! Thank you for hanging with me. And what an event! An extremely well coordinated parade run brings all the motorcycles from a starting point in Elburn, Illinois to the event grounds in Batavia. Multiple bands, including at least one national/international act, perform on different stages through the day. A variety of food vendors tempt attendees with their wares, providing in effect a “Taste of DuKane” atmosphere. Product and service vendors also dot the grounds. A bike show with trophies and prizes takes place. 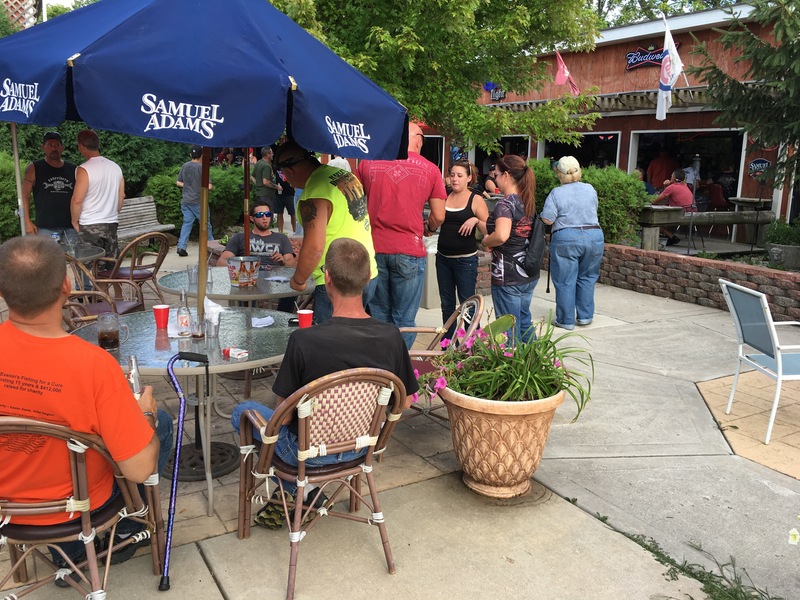 All of these things come together in an effort to attract the attendees, bikers and non-bikers alike, who bring many toys and food donations, enough to benefit eighteen different local charities! But what does it take to put on an event such as this? A lot of people putting forth a great effort, beginning months in advance, that’s what. The DuKane A.B.A.T.E. Toy and Food Run takes place in October of each year. Planning for this year’s event began last December! There are volunteer coordinators, site coordinators, entertainment coordinators, security coordinators, public relations and publicity coordinators (that’s where I play my modest part), political coordinators, human and vehicular traffic coordinators, set-up and tear down teams, stage coordinators and technicians, electricians, carpenters, donation collectors and coordinators, medical and first response teams, a flag line, membership coordinators and promoters, all this and more. In most cases each coordinator has additional people assisting him/her. All are volunteers, gaining nothing more than the satisfaction of a job well done for the benefit of others in need and support of the motorcycling community and their rights. It is my pleasure and my honor to be associated with these people. As I write this, the 30th Annual DuKane A.B.A.T.E. Toy and Food Run is less than twelve weeks away. As much as I do not look forward to summer passing by any faster than it already does, I must admit I am getting rather excited about this. The view from my hotel window at 6:00 on Sunday morning was not encouraging, nor was the radar image on my phone’s weather app. A rather large, albeit not severe, storm system was moving into the area from the northwest. 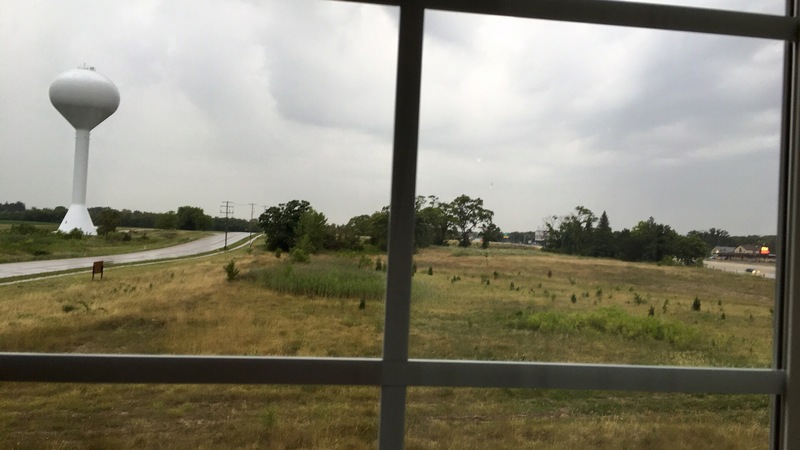 With a few hours remaining until I would head for Lake Geneva for the combined Chicagoland and Wisconsin Ride for Kids, or not, I kept checking the radar and looking out my window as the system rolled in. Within an hour, my friend Ann had messaged me her regrets. It was already pouring rain and thundering by her, so she opted out of joining me for the ride. I agreed with Ann’s decision 100%, though I’d by lying if I said I wasn’t disappointed. A little while after that,the rain arrived in Kenosha, too. I decided to go downstairs, load a few things onto the bike, grab some breakfast and see what the weather was going to do. And what it did was get very, very wet in short order. But then a funny thing happened. By the time I walked out of the breakfast room, it had stopped raining. I walked outside, just to make sure my eyes hadn’t been playing tricks on me. The pavement was still quite wet, but there was not a drop of rain falling any more. I checked the time. It was just after 9:00, still plenty of time to pack up, check out, and head for Lake Geneva. So that’s exactly what I did. I had donned my rain gear as a precaution. The rain was gone and the sun was beginning to peek out from behind the dissipating cloud cover, but there was still plenty of spray being kicked up from the wet road surface—at least until the road dried out, which happened surprisingly quickly, thanks in part to the plentiful gusting wind. As I pulled into the Grand Geneva Resort, I couldn’t wait to get out of that rain suit and put on some sunscreen. The wind was still whipping, but the day had become sunny and dry. Unfortunately the damage had already been done with regard to attendance. I have been participating in the Chicagoland event since 2003 and this was by far the least attended of any to which I have been—and the donations collected reflected this as well. But those of us who were there managed to have a good time and came away with the satisfaction of knowing that we helped the kids. In the end, that’s what matters most.